So states the Pulitzer Prize citation for W.S. Merwin, a pacifist well-known for his anti-war poetry. Merwin has published over 20 books of poetry and almost 20 books of translation. He won his first Pulitzer Prize in 1971 for The Carrier Of Ladders. Known in the 1960s as an anti-war poet, Merwin is now an environmental activist who speaks out about restoring the rain forests of Hawaii. In the early 90s, I stumbled across his collection The Lice (1973) in a small musty used book store in downtown Los Altos near Stanford. I wish I knew the woman who owned the book before me; I suspect it was a woman’s book, her miniscule carefully penciled notes illuminating the manuscript and her life and mine. I hold in my hands remnants of her life as well, remnants she left stuck in the book: a youthful picture of Merwin, cut to follow the intricate border from its newsprint magazine home. It rests between the poems “”Whenever I Go There” and “Wish.” Tucked between the leaves I also marvel at a request for a book by Tu-fu Yu, Chinese characters penciled in, information on the text typed in triplicate charcoal. I traveled with that slim volume in my van for years, there along with Marianne Moore’s O to Be a Dragon, grounding me and comforting me in my restlessness and homelessness, with my struggles with memory. So back in the mid 90s, when I heard he’d be reading at UCLA Hammer Museum, I slipped in from the afternoon LA traffic to sit near the front on the cool floor leaning against the wall, amazed at his vitality, his rich, sonorous, melodic, gracious voice, and his shock of white hair. I stood in line to meet him and shake his hand but neglected to bring my book to have him sign it. I heard him read April 13, 2006 at UCSB in packed Campbell Hall, hundreds of fans there, and lined up after the reading to get him to sign books. I had him sign the page for “Waves of August” in my hardback copy of his National Book Award winner, the massive Migration which collects much of his life’s work. I told him that I remembered the moment I first read the poem in The New Yorker. It stunned me. It stuns me still. Fresh Air from WHYY, April 21, 2009 · W.S. Merwin won his second Pulitzer Prize for poetry on April 20 for The Shadow Of Sirius. 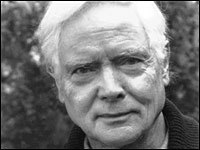 In a 2008 interview, Merwin read a few of his poems and talked about memory, mortality and acceptance in his poetry. Merwin has published over 20 books of poetry and almost 20 books of translation. He won his first Pulitzer Prize in 1971 for The Carrier Of Ladders. Known in the 1960s as an anti-war poet, Merwin is now an environmental activist who speaks out about restoring the rain forests of Hawaii. Today, he was named the 2009 Pulitzer Prize winner for poetry. It was just a few weeks ago that I found myself standing under WS Merwin’s name at the intersection of New York Avenue and Fourth Street in Union City, begins John Gomez For The Jersey Journal. Monday’s announcement that WS Merwin won the 2009 Pulitzer prize for poetry marked the second time that an author published by Copper Canyon Press has won. Merwin, an 81-year-old poet from New York, said that Copper Canyon’s sole focus on poetry was one of the reasons he went to the small publisher. This year’s prize marked the second time Merwin had been honored with a Pulitzer. In 1971, he won for “The Carrier of Ladders” and refused to accept the prize money in protest of the Vietnam War. This time, he’ll mark the day more quietly, celebrating with his dog while his wife is out of town. Tips for Writing Emails Someone Will Read! 7. Kill your favorites. Is something in your text particularly pithy, amusing, or clever? Chance are, it’s not. If it sticks out, it’s probably a tap-dancing gorilla in boxer shorts — hilarious when you thought of it, embarrassing when it gets in your manager’s inbox. Sonia Simone’s superpower is creating better customer relationships with incredibly effective communication. She’s Senior Editor for Copyblogger, and a big Twitter junkie at @soniasimone, where she says she tweets way, way too much.